The anterior ramus (pl. 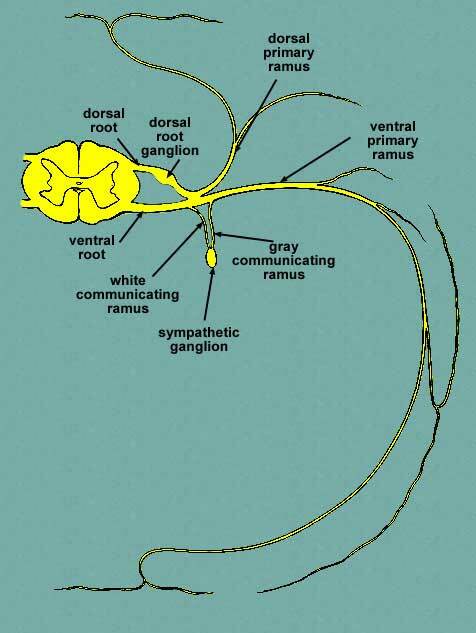 rami) (Latin for branch) (ventral ramus), is the anterior division of a spinal nerve. The anterior rami supply the antero-lateral parts of the trunk and the limbs. They are mainly larger than the posterior rami. In the thoracic region they remain distinct from each other and each innervates a narrow strip of muscle and skin along the sides, chest, ribs, and abdominal wall. These rami are called the intercostal nerves. In regions other than the thoracic, anterior rami converge with each other to form networks of nerves called nerve plexuses. Within each plexus, fibers from the various anterior rami branch and become redistributed so that each nerve exiting the plexus has fibers from several different spinal nerves. One advantage to having plexuses is that damage to a single spinal nerve will not completely paralyze a limb. There are four main plexuses formed by the anterior rami: the cervical plexus contains anterior rami from spinal nerves C1-C4. 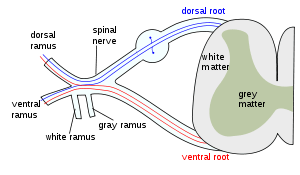 Branches of the cervical plexus, which include the phrenic nerve, innervate muscles of the neck, the diaphragm, and the skin of the neck and upper chest. The brachial plexus contains anterior rami from spinal nerves C5-T1. This plexus innervates the pectoral girdle and upper limb. The lumbar plexus contains anterior rami from spinal nerves L1-L4. The sacral plexus contains anterior rami from spinal nerves L4-S4. The lumbar and sacral plexuses innervate the pelvic girdle and lower limbs. Anterior rami, including the sinuvertebral nerve branches, also supply structures anterior to the facet joint, including the vertebral bodies, the discs and their ligaments, and joins other spinal nerves to form the lumbo-sacral plexus.